Looking for big performance from BMWs small inline 6? Do it best with our CP M20 Forged Piston Kits. We feel that CP-Carrillo Pistons are the best pistons for your BMW high performance or racing engine, bar none. We work tirelessly to improve these types of products and work with the manufacture to offer the best.... That's why we have become CP-Carrillo's exclusive distribution partner for all BMW applications! These are the same premium CP pistons we use in our winning race and high performance street engines around the world and each of our M20 CP Forged Piston Sets includes excellent quality piston-rings, piston pins and locks making it a great deal vs. simply buying new rings. Specifically meant for the popular M20 stroker setup; the popular "Frankenstein" of "i" head with eta or diesel crankshaft. This piston set insures that no matter what rod set you select, you will get the correct compression height and therefore compression ratio and ring position. 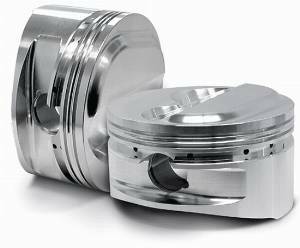 Most times, we have in-stock a variety of compression ratios and can also supply you with custom piston applications quickly. However, since this is typically a custom configuration specifically for the stroker M20, your pistons may be made to order. Custom Pistons/ expediting an order. If your selection is not in stock (due to the custom nature of these pistons, some may not be) and you need pistons quickly, Expedited production services are available for applications not in stock; 2-3 week, 1-2 week, or 4 Day. Please make a note when completing your order if you would like this service and we can make the charge. Don't see what you need or have a question? Give us a call at 215-462-4666 or email us and we can help with any custom kit need.